Despite the poor publicity that surrounds Leylandii hedging, they are still one of the best hedging conifers around. Yes they can grow to extreme proportions and yes, they can cause neighbour disputes, but when kept under control its growth can be more dense and compact than any other hedging species available today. 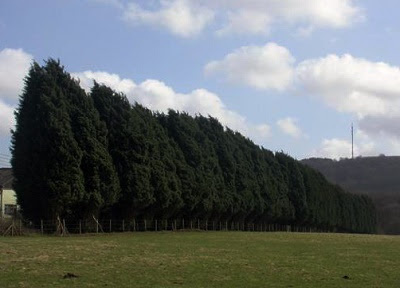 If you are obsessed with straight lines and sharp edges then Leylandii hedging is the hedging for you. Plant Leylandii hedging from April to May or from October to November at a spacing of between 18 inches to 3 ft depending on how tall you require your hedge. Spring planting is usually recommended, however to give them the best start the ground should be prepared over the previous autumn and winter. Leylandii hedging will require a good, deeply cultivated soil, but remove all perennial weed roots and provide a thick layer or well-rotted farm manure or garden compost 12 inches below the surface before planting. For taller specimens or when planted in exposed positions, consider providing support such as sturdy bamboo canes. If the site is particularly wet or prone to waterlogging then raise the soil level to create a slight ridge of approximately 12 inches high and 24 inches across. Plant in a single row using a garden line to ensure a straight hedge or a guide-line for a curved hedge. Dig a square hole about twice the width of the rootball of the plant, although depending on the ground it can sometimes be easier just to dig a trench. It may seem odd in this instance but dig the hole about two inches deeper than the rootball of the plant as the soil level will drop over time. Do not disturb the roots or the root ball when planting. The newly planted leylandii will need to be watered once or twice a week during their first growing season, more during dry spells during the spring and early summer. Do not allow any other plants including weeds to grow with in 12 inches of the hedge. Apply a top dressing of well-rotted farm manure or garden compost the following spring. Don't wait for the plants to reach their designated height before trimming back as this can result in bare and straggly growth at the base. 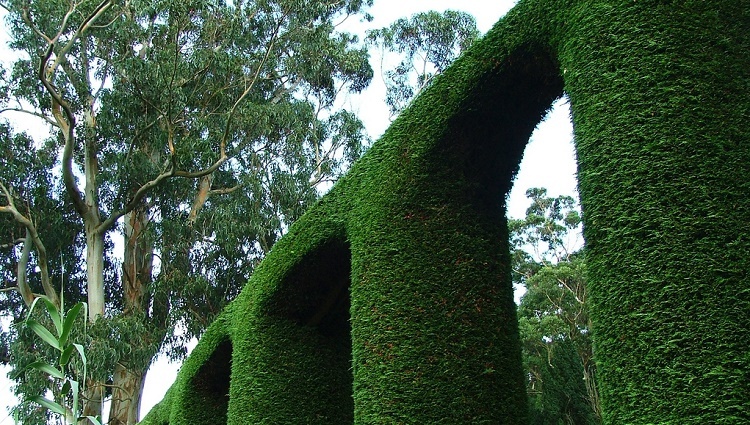 Trim back any branches that do not fit with the the shape you want your hedge. This will encourage the hedge to thicken out quickly. 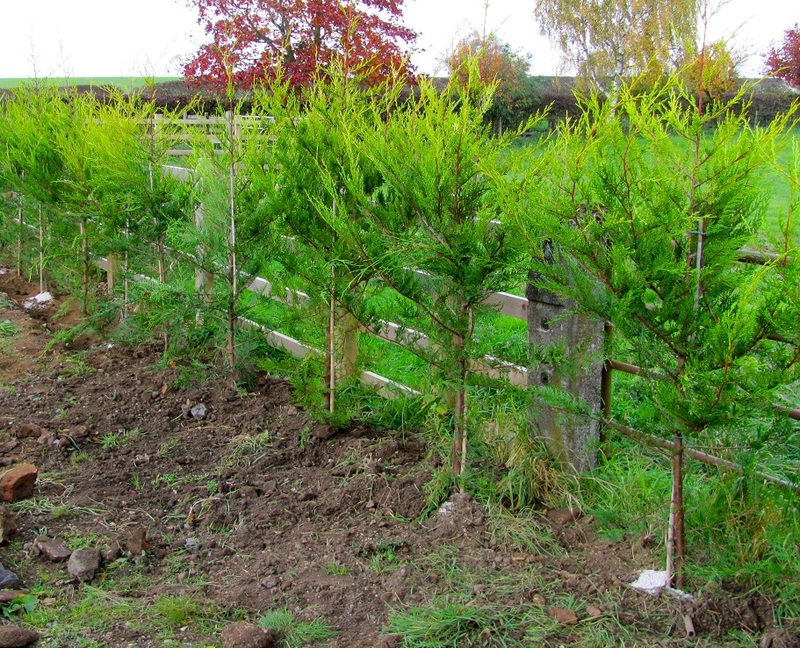 Once the height of your Leylandii hedge is within 6 inches of the height required prune out the leaders. This will also help the plants thicken out.